Whether you're hungry for Mexican food in Gangnam, Apgujeong or Hongdae there's a little chain of restaurants that will fill you up for a very reasonable price. 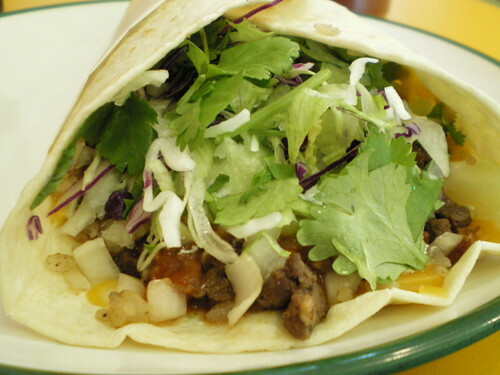 Dos Tacos has a great selection of tacos, burritos and quesadillas. 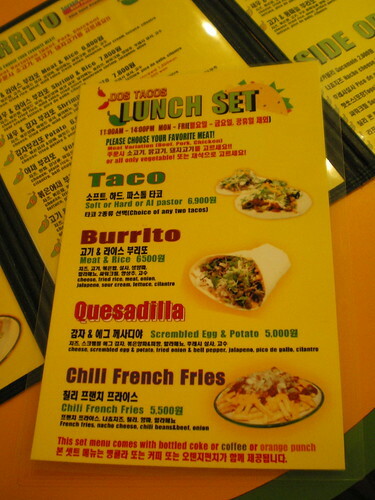 The lunch menu offers two hard, soft or al pastor tacos for 6,900 won, a meat and rice burrito for 6,500 won, a scrambled egg and potato quesadilla for 5,000 won or chili french fries for 5,500 won. All these options come with either coke, coffee or orange punch. You get to choose your own meat whether it be beef, pork or chicken. 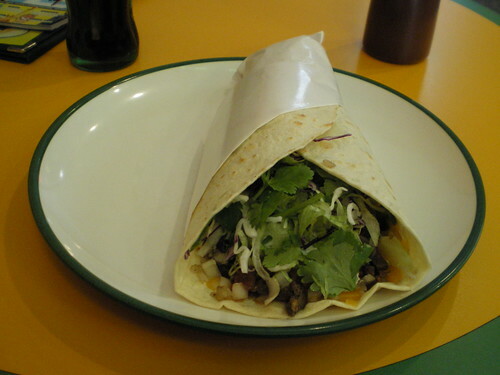 I went for the beef burrito and was pleasantly surprised by the huge handful of coriander that awaited me inside my wrap. I'm not an expert on Mexican food, the closest I've ever gotten was a visit to Houston, Texas and a big plate of sizzling fajitas, but Dos Tacos serves a tasty burrito. It may or may not be authentic, I wouldn't be able to tell, but it's a cheap and tasty way to fill yourself up. Service was friendly and fast, though cutlery, napkins and the like are all at the counter waiting for you to get them yourself. 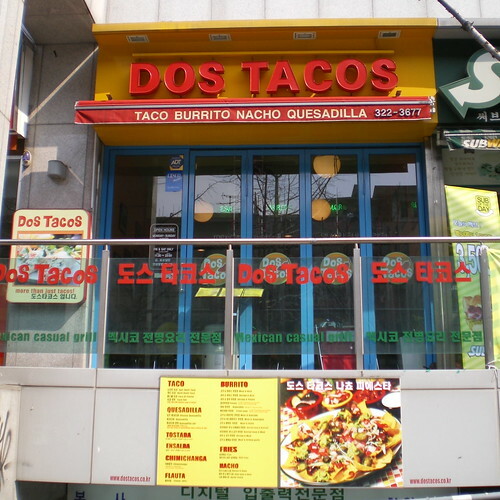 To get to Dos Tacos in Hongdae take exit 6 from Hongik University station and head up past VIPS and the KB Star bank. Dos Tacos is a little further up towards the University, it's located on the left hand side of the road in the Prugio building, next to Subway. Visit their website or call them on 02 322 3677.
if you guys predestined to stationary [url=http://www.generic4you.com]viagra[/url] online you can do it at www.generic4you.com, the most trusted viagra drugstore repayment in release uphold generic drugs.